With an abnormally warm start to spring this year it’s easy to get anxious and hop out onto that high mountain trail you’ve been studying all winter. But keep in mind this past winter saw abnormally high snow levels, so those high elevation routes may still be inaccessible until July or August. Picking a place for early spring hiking does not come without risk for those in high elevation territory, which is why the U.S. Forest Service is warning people in Washington to be safe and choose wisely. “I think people are underestimating the conditions and we have a number of trails that are relatively close in, like Lake 22 or, say, Mt. Pilchuck, and there’s snow on them. We have route-finding issues, traction issues,” explained Matt Riggen with the Forest Service, who is based at the Darrington ranger station to KIRO Channel 7 in Snoqualmie. Before you head out check the snow level elevation in the area where you will be travelling. Often this information can be found at the nearest Forest Service Rangers office, which you should be stopping at anyway every time you enter a National Forest. Even if the area you are travelling is below the snow line, just getting to the trail head could be a problem. Back country roads could be closed for falling trees and must be serviced by park service officials before reopened for the spring. Again, this is information you can gain from a ranger. Even if the trailhead is accessible and the beginning of the trail looks good. Often that trail will have an entirely different feel when its broadside to the wind and a cold front has moved in toward the summit. A girl hiking in the UK earlier this year was caught off guard by a blizzard wearing shorts. Once those conditions have changed, what might likely happen? One thing to consider is you may lose traction. The trail could be frozen in parts and there could be ice at the most inopportune time like the trail in Southern California that claimed the lives of three people last year. In many parts over the winter the trail could be washed out or obstructed and it might be very difficult to find the trail. This creates a greater likelihood that you could get lost. Take this into consideration and plan on carrying maps and GPS or not going at all. Without proper precautions you can easily get lost or hurt. Let’s say you’ve taken all the precautions and you’ve even packed a pair of crampons or snowshoes. 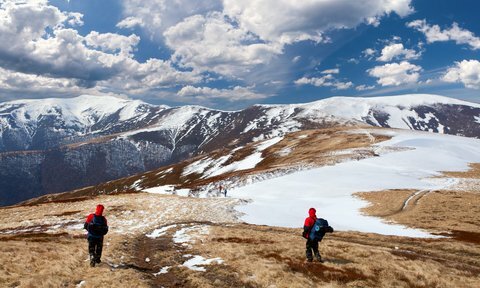 Hiking in early spring means there’s an increased risk of avalanche and other collapse. Last year the cliff side above the Big Four Ice caves in Washington collapsed. Water erosion, melting snow and washed out trails can all contribute to the loss integrity on the trail that could put you and your hiking partners in serious danger.